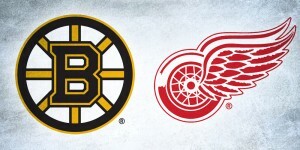 The Stanley Cup Playoffs are an exciting and crazy time for hockey fans, and the first round certainly didn’t disappoint. If we learned anything from the conference quarterfinals, good design doesn’t always win out in the end, as some of our first round picks didn’t advance to the second round (if you missed it, you can catch up here). The competition’s getting tougher as the field narrows to eight, but we broke down the second round matchups and made our picks for the 2015 playoff bucket showdown. 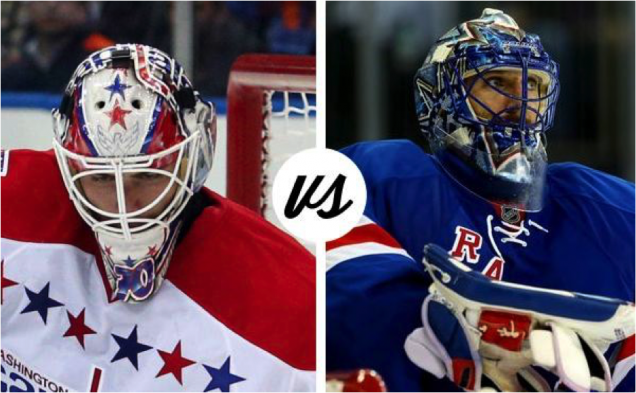 In our first Gunnarsson-versus-Gunnarsson matchup of the conference semifinals, it’s a battle of American patriotism between Holtby’s star-spangled bucket and King Henrik’s big apple glitz. 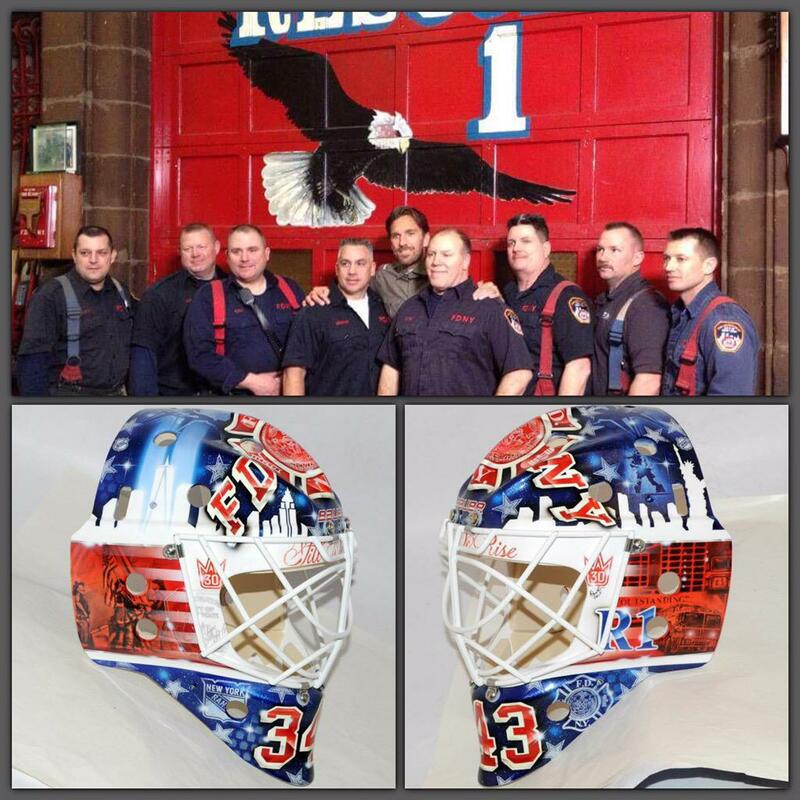 Hank has sported a bevy of red, white and blue masks this season, so for the purposes of the first round matchup, we looked at his most recent FDNY tribute mask, which ultimately lost out to Fleury’s designer-friendly 90’s colorblocking. 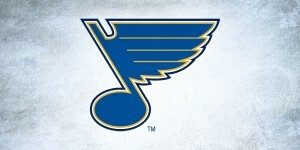 In the series against the Penguins, Hank went back to his glitter-laden mask with metallic blue cage – presumably what he’ll stick with in round 2 as well. 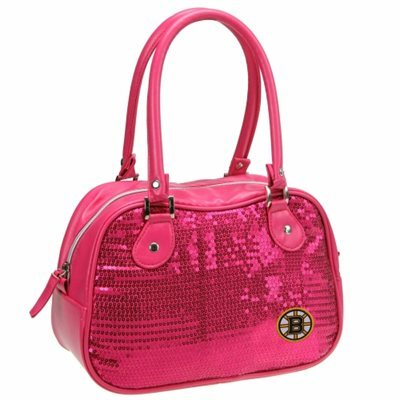 I’m often wary of anything that mixes sparkles with hockey (Eek! My eyes!) 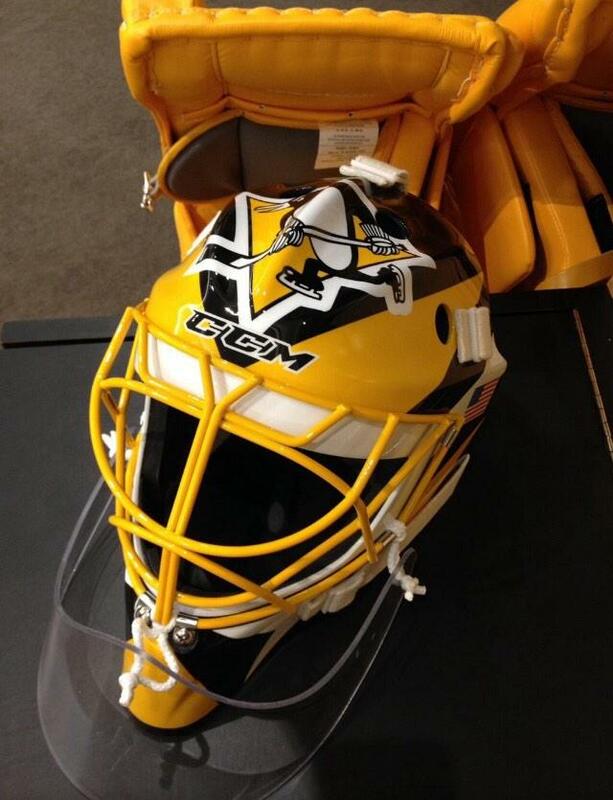 but in this case, Lundqvist’s mask just works. 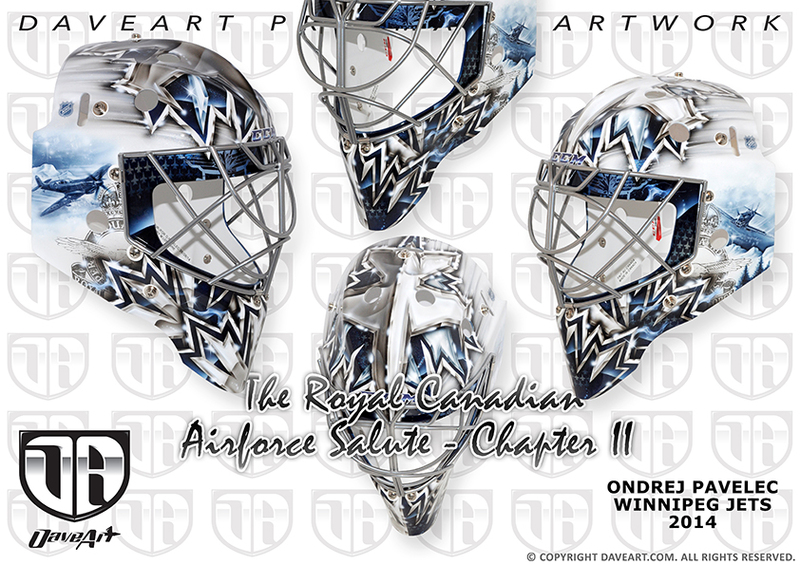 Both his and Holtby’s masks are simple in composition with Gunnarsson’s detailed accents and special effects woven throughout. 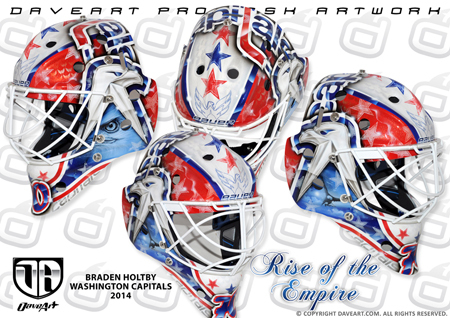 The graphic nature and simplicity of Lundqvist’s crown however, allow the beauty of the paint job to really shine (no pun intended) and provide that little extra push over Holtby’s slightly busier mask. 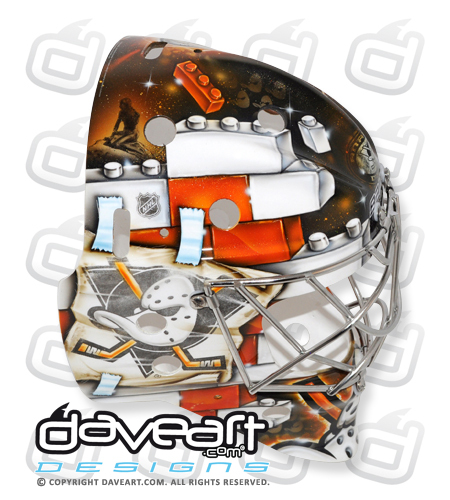 In another all-Daveart matchup, Ben Bishop’s glow-in-the-dark masterpiece takes on Carey Price’s logo-laden design for a berth to the Eastern Conference finals. 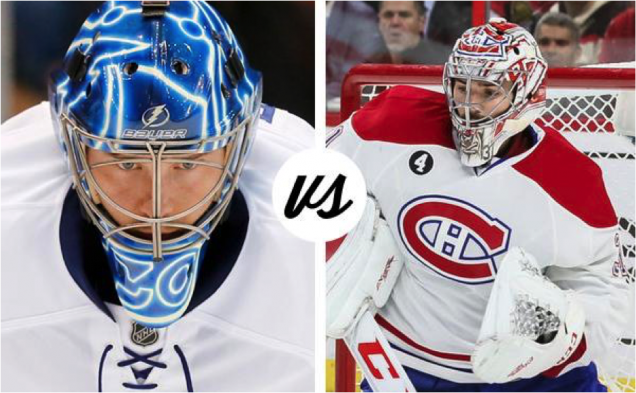 Like their respective teams, both these masks advanced in the first round – Bishop’s with far more ease than his Bolts’ 7-game battle with the Detroit Red Wings – but while Price’s mask is undoubtedly classic and beautifully painted, Bishop’s innovative glowing mask blows yet another opponent’s out of the water. 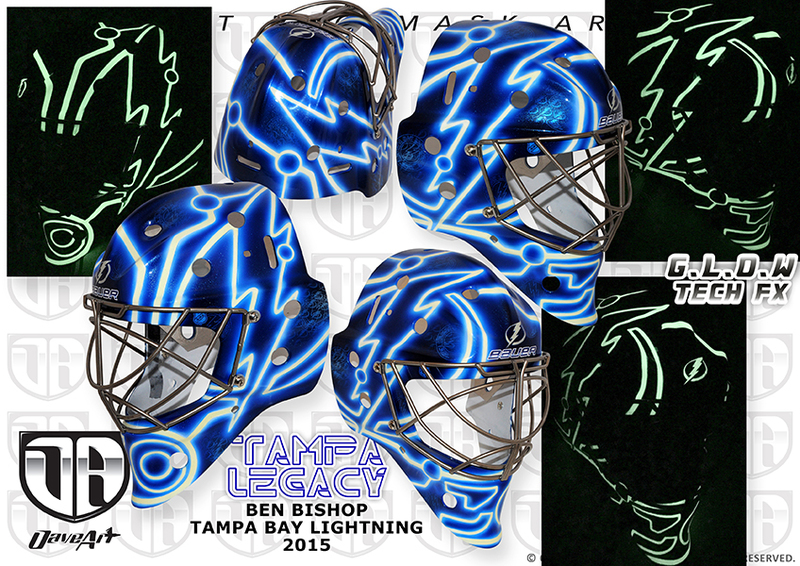 Dave Gunnarsson has used his glow-in-the-dark paint on other masks as well, but Bishop’s lightning graphics in particular lend themselves to the forward-thinking special effects, creating a fresh and unique look. 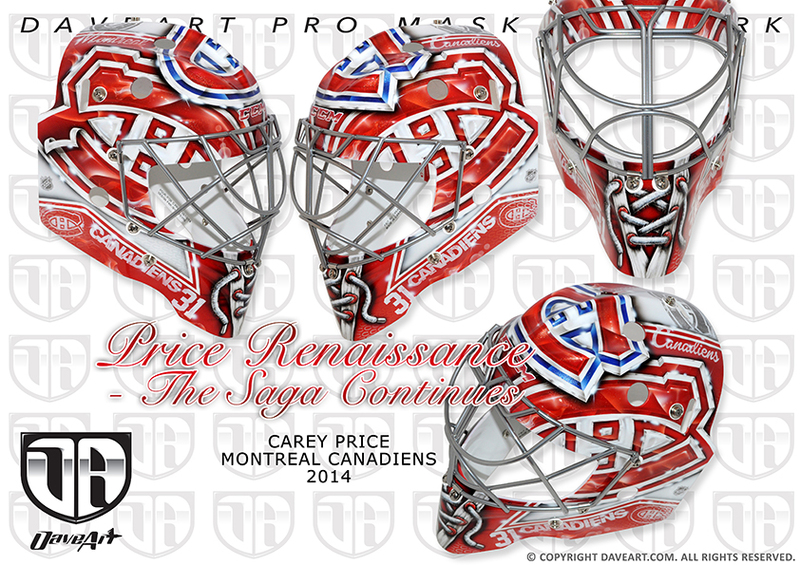 Ultimately, while there’s not much to negatively comment about Price’s mask, Bishop emerges victorious in the end. While playoff veteran Corey Crawford seemed to be a shoo-in for the Blackhawks starting job, a shaky game one showing opened the door for Illinois-native Scott Darling to step in and steal the show. 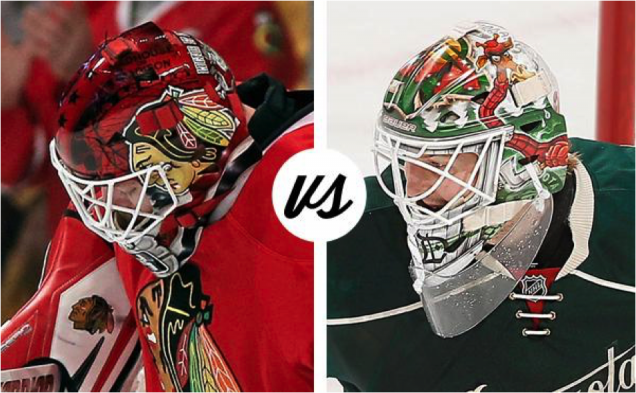 In retrospect, Crawford’s mask looked far better than the goaltender himself – strong enough to have earned him the first round victory over Rinne – but for round two, Darling’s mask squares off against Dubnyk’s woodsy giraffe. 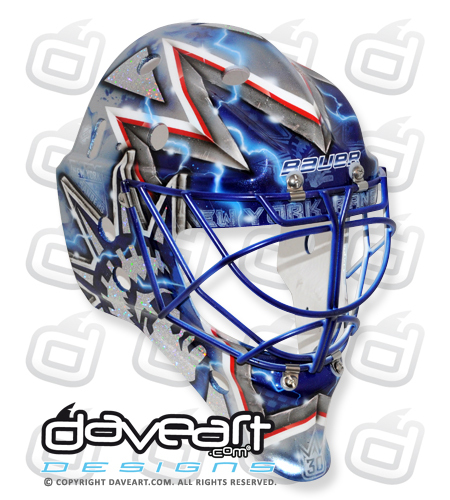 Painted by Jason Livery at Headstrong Grafx, Darling’s new bucket is the ultimate tribute to his hometown of Chicago. In a recent interview with InGoal Magazine, the netminder described, “that feeling of being from here and have this be where I call home and have this chance to play for the Blackhawks really is indescribable… That is something you couldn’t really put on a mask.” The black-on-red design is a collage of sorts of all the city’s highlights, including the Sears tower and bean and scenes from numerous Chicago-based films. 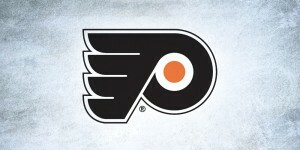 The logo and jersey striping on each side really jump into the foreground, while the monochromatic city montage creates a dynamic and meaningful backdrop. 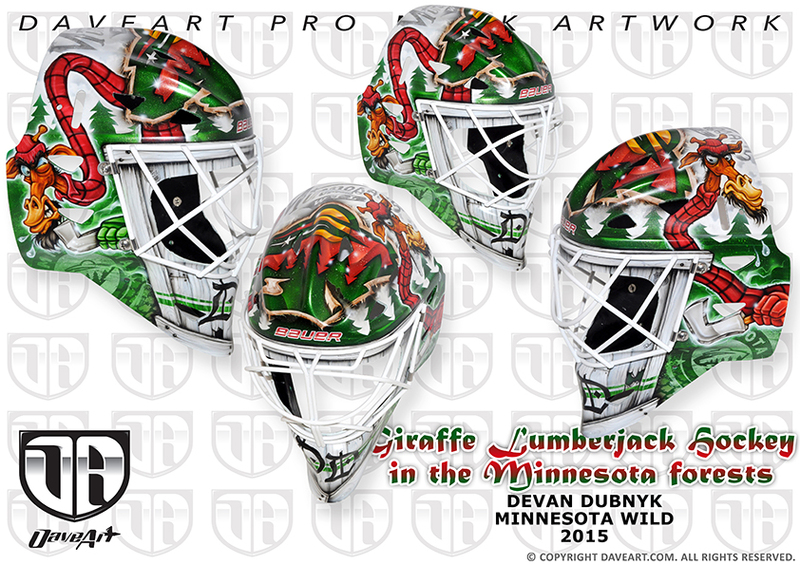 As far as Dubnyk’s mask goes, it’s chock-full of Dave Gunnarsson’s signature detail and artful special effects, but the cartoon giraffe is just no match for Darling’s ultimate tribute to his hometown windy city. 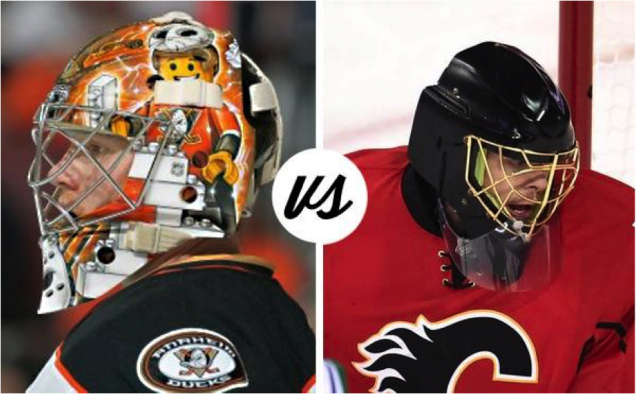 Andersen and Hiller both won their first-round mask matchups, besting Ondrej Pavelec’s fighter jet bucket and Lack’s Vancouver heritage mask, respectively, and now the lego man takes on Darth Hiller in round two. This contest is tough because from a design standpoint, we’re comparing apples and oranges. Gunnarsson and Alec Voggel of Airxess, while both incredibly talented artists, couldn’t be more different in their styles. 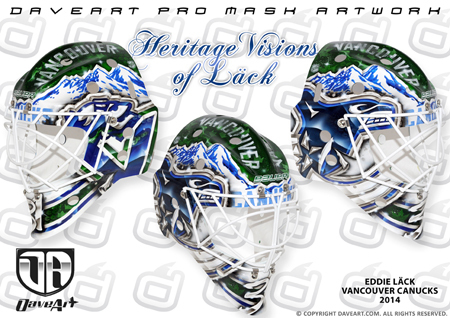 Both goalies’ masks have garnered a great amount of attention of the course of the season, but for different reasons; Andersen’s for his fun and nostalgic themes, and Hiller’s for his well, lack of themes or design. Despite the mixed reactions, I’m a big fan of the sharpness and mystery that come with the void of imagery in Hiller’s masks, but due to the innovative and playful design of Andersen’s lego man, the slight edge goes to Freddie.